Earlier this month, the Moto Z Play received Android 7.1.1 in overseas countries including Brazil. In the states, the update gave the Moto Z Play Droid the distinction of being the first Moto handset in the country to run on this Android build. That update included Android 7.1.1, the June 2017 Android Security Patch, video chatting app Duo, an update to v 2.0 of the Moto Mods platform, and some stability improvements. 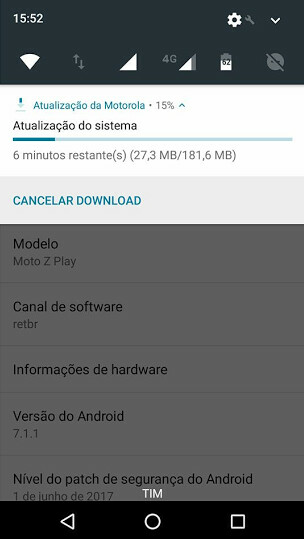 Now, it appears that the Moto Z Play is receiving another update in Brazil. Those who agreed to use their Moto Z Play as a guinea pig for a soak test are currently receiving the new files. With a version number of NPN26.118-10, the new update weighs in at 181.6MB. Unfortunately, being a soak test, there is no changelist that we can refer to. After the update, the phone continued to run Android 7.1.1. We are hopeful that once the update is released for one and all, some sort of changelist is released. To take part in a soak test on your Motorola device, you need to be a member of the Motorola Feedback Network. You must also agree to certain conditions, including one that prevents soak testers from squealing to the press about the new update. My MOTO Z Play (XT1635-03) Still runs on marshmallow! What a shame for Motorola. Depends on what region your phone is in as the Verizon model got nougat months ago.